(The Society of the Friends of the Rights of Man and of the Citizen, mainly known as Cordeliers Club, was a populist club during the French Revolution. 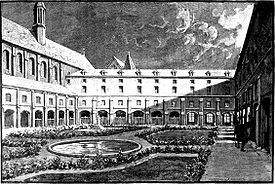 This society held its meetings in the Cordeliers Convent, and quickly became known as the Club des Cordeliers. It took as its motto the phrase, Liberté, égalité, fraternité. The Cordeliers were the rivals of the Jacobins, and numbered among its members Paré (the president), Danton, Marat, Camille Desmoulins, Hébert, Chaumette, Dufournoy de Villiers, Fabre d’Eglantine (a journalist), and others. The Club of the Cordeliers was far in advance of the Jacobins, being the first to demand the abolition of the monarchy and the establishment of a commonwealth instead. Its leaders were put to death between March 24th and April 5th, 1794. After Marat’s assassination the club was led by Jacques René Hébert, and it drifted to the extreme left. Controlling the Paris commune, the Hébertists seemed a threat to the power of Maximilien Robespierre, who had them executed during the Reign of Terror. Have no illusions about the Venezuelan opposition. If they take power they will suspend the constitution and launch bloody reprisals. Obama intends his legacy to be a ruthless rollback of everything the people of Latin America have gained over the past 15 years.